Italian ryegrass, Lolium multiflorum Lam., is native to southern Europe, Italian ryegrass is a cool-season, annual or biennial bunchgrass. Mature plants grow 1 to 3 feet tall. Stems (culms) are often purplish at the base and consist of nodes and internodes. A leaf attaches to the stem at each node. Leaf sheaths are often tinged red at the base, a feature that distinguishes the plant from perennial ryegrass. Leaf blades of Italian ryegrass are rolled in the bud (unlike perennial ryegrass, which are folded in the bud). The blades are dark green and 2 ½ to 8 inches long. They are prominently veined on the upper surface, while the lower surface is smooth, shiny and hairless. Auricles (small claw-like appendages at the junction of the leaf sheath and blade) are conspicuous and help distinguish this grass from others. These auricles clasp around the stem and can be confused with quackgrass. 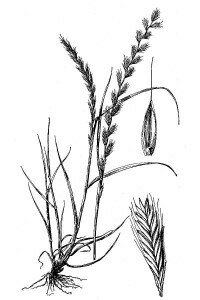 The top stem segment supports the seedhead, which in the case of Italian ryegrass is a solitary spike that ranges 4 to 16 inches long (typically 12 inches) and consists of alternately arranged spikelets that attach edgewise (parallel) directly to the flowering stem. Quackgrass seeds are arranged perpendicular to the flowering stem. Short awns (bristles) on spikelets and at least 10 florets per spikelet help differentiate Italian from perennial ryegrass (see pictures). The root system of Italian ryegrass is highly branched and dense, with many fibrous, adventitious roots. While the root system is primarily shallow, it can be very extensive. Italian ryegrass regenerates entirely by seed and germinates readily with sufficient moisture. The plant is best adapted to cool, moist climates, and grows best between 68 and 77°F. It is highly shade intolerant but can adapt too many climatic conditions. Italian ryegrass grows in a wide range of soil types, although it prefers fertile, well-drained soils. Italian ryegrass is a problematic weed in cereal crops and grass seed crops. It establishes quickly and grows rapidly. For that reason, in certain areas it is planted as a cover crop and quick food source. Italian ryegrass is very palatable and nutritious for livestock and most wild ruminants and is planted in many pasture settings. 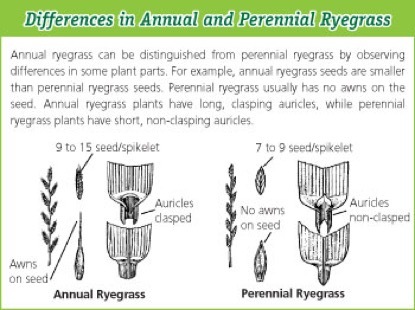 Prevention: Prevent introduction of ryegrass onto property by ensuring that seed, feed, and equipment are free of ryegrass contaminants. Control is becoming more difficult every year due to its adaptability, high seed production, and adapted tolerance (resistance) of many herbicides used for control. Chemical: Herbicides have been used in crops to control established plants and prevent seed production, but the Lolium species is gaining resistance to several herbicides. For instance, Diclofop-resistant ryegrass is a major weed problem worldwide. Italian ryegrass has documented resistance to most group I and group II herbicides (ACCase & ALS) in the Pacific Northwest. There is also documented cases of resistance using long-chain fatty acid inhibitors (flufenacet – Axiom) and EPSP synthase inhibitor (glyphosate). Herbicide resistant crops (Clearfield Wheat) may be used in some areas. The use of imazamox on Clearfield® wheat can provide effective Italian Ryegrass control, however, continued resistance has also become widespread to this group II herbicide. The herbicide pyroasulfone + carfentrazone (Anthem Flex – long chain amino acid and PPO class herbicides) has shown effectiveness in ryegrass control. Applications of pinoxaden (Axial -ACCase class herbicide) or pyroxsulam (Powerflex – ALS class herbicide) have been able to enhance control of Italian ryegrass. Italian ryegrass is one of the most, if not the most problematic weed to manage in small grain production. To prevent resistance and manage ryegrass populations, use herbicides with different modes of action on a rotational basis and implement alternative crop rotations.